Tigaki is located 11 kilometers far from Kos town and 7 kilometers north of Asfendiou village. Tigaki’s permanent residents reach around 250. It is a holiday resort which has undertaken a lot of development during the past decades especially along its long sandy coastline on the northern part of the island. Years ago the place used to be the local’s favourite holiday resort. The natural environment in Tigaki is impressive and calming, with lots of green all around and many plants and colourful flowers that decorate the landscape. 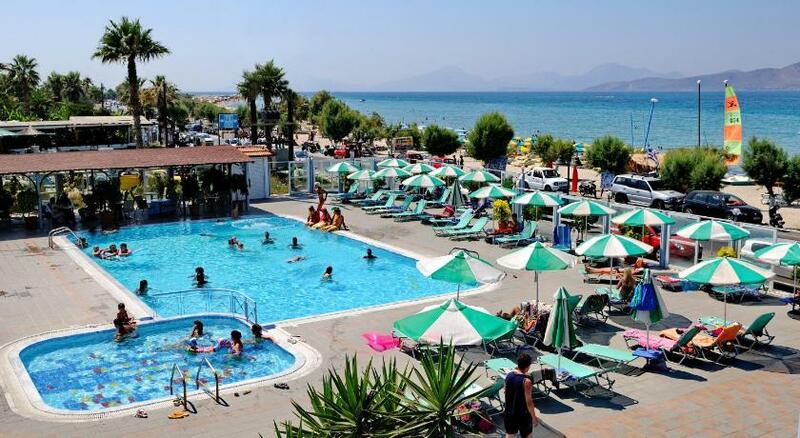 The various accommodation alternatives close to the beach and in the surrounding area, along with a very peaceful, traffic-free environment made Tigaki one of the most popular destinations on the Kos island. The good food starts from fresh fish at the taverns and ends at the local or European cuisine alternatives. Nevertheless if you want something faster there are a lot of snack bars and fast foods that will keep you going through the day or night. In Tigaki there are many shops to choose from most of them located centrally and open all day offering many things to buy. The various clubs, bars and discos guarantee a satisfying nightlife which may last until the early morning. Visitors can enjoy swimming, sunbathing and sports on the sandy beach with its crystal clear waters (10 kilometers long), which has more than once been awarded the blue flag, not only for being very clean, but also due to its excellent organisation and facilities.The waters at Tigaki beach are very shallow therefore making it ideal for families with small children and for those who are not good swimmers. Windsurfing fans will love this place, as there are many big waves to catch in the open sea and for those less experienced but willing enough to try there is a training centre available on the beach. When you’ve had enough of swimming and sunbathing everyday, then it’s time to walk around the many places available in the area. “Alikes” is a wetland close by and easy to walk to. Further away (2 up to 7-8 kilometers) you will find many little villages with lots of interesting things to see (Zipari, Asfendiou, Pili, Palio Pili). Medical issues are covered by the Health Services of Kos town. Access from Kos town is easy (11 kilometers) by public bus, which runs frequently, almost every hour, by taxi, by car, by motorbike and also by bicycle since its distance from Kos town is only short. Bear in mind one of the most popular means of transport in Kos Town are bicycles. The airport is 15 kilometers north-east. Located along the north coast of Kos, Meni Beach Hotel offers rooms with view to the well tended gardens or Tigaki Beach. The complex is a newly built apartment hotel offering luxurious studios and apartments with modern and tasteful furnishings. Surrounded by a well-tended garden, 900 metres from Tigaki Beach of Kos, Sunny Days features self-catering accommodation with a private balcony.